New by the makers of Calendulis Plus Cream. An eczema cream designed especially for children. Having eczema means that you have sensitive skin and for children with eczema their skin is extra sensitive. In fact children with eczema often can’t use the creams designed to treat their eczema because they are too harsh for their skin. GN Kids Eczema Cream is designed especially for kids. Available in a handy 75g tube. Apply 2-3 times a day to the affected area. As with any product being used for the first time I recommend the GN Kids Eczema Cream be patch tested on an unaffected area before being used on the affected areas. 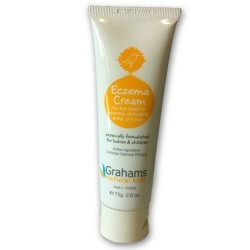 For best results use with Grahams Natural Kids Eczema Body and Bath Oil. For external use only. Do not take the product by mouth, and do not let product get into eyes. If product gets into eyes, flush with water until it is out and consult your physician if necessary. If redness, irritation or other reaction develops, discontinue use immediately and consult your physician. This is a new product so I have not had a lot of feedback, however the cream does have minimal smell and is less likely to sting when applied as it is not made up of the herbs found in the Calendulis Plus Cream. I like it. It feels nice on the skin, not greasy.